I've been working on my postgradute course with some picture editors as images are crucial parts of texts, just as we ask our students to interpret text, we should also ask them to learn to read images and, therefore, we -educators- should provide them with suitable input that triggers thinking. Not only should we comfort with what we find but also work on better visuals. The tool that I most like was the one used to make photographs transparent. 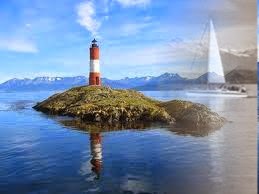 This is my example, I used the lighthouse photograph and, then, added the boat. But, what happens when you need to edit pictures and you don't have your computer with the program you always use? Internet will help you. Editing online rules! =P There are thousands of free tools - for some, you may not even need an account. You can use online or paste as an image wherever you want. With http://es.photofunia.com/ you can choose what framework your picture or text will have.